Want to boost your confidence and reduce stress for free, in two minutes, with no special skills? And how long does that take? Got a couple of minutes? After two minutes standing in a power pose (think Wonder Woman), study participants tested higher on testosterone and lower on cortisol. These two hormones are key in facilitating our leadership qualities. The higher the testosterone, the higher our confidence, the lower the cortisol, the lower our reactivity to stress. This is such an effective and portable tool for changing our relationship to how we think and feel through our bodies. Perfect for a space a small as a bathroom (or even a toilet cubicle) before a high-stakes presentation. The infographic below, from Brazilian magazine Superinteressante illustrates how we shrink and expand, and what that communicates to others. The study results showed that post power-pose, participants were rated more highly in an interview situation. 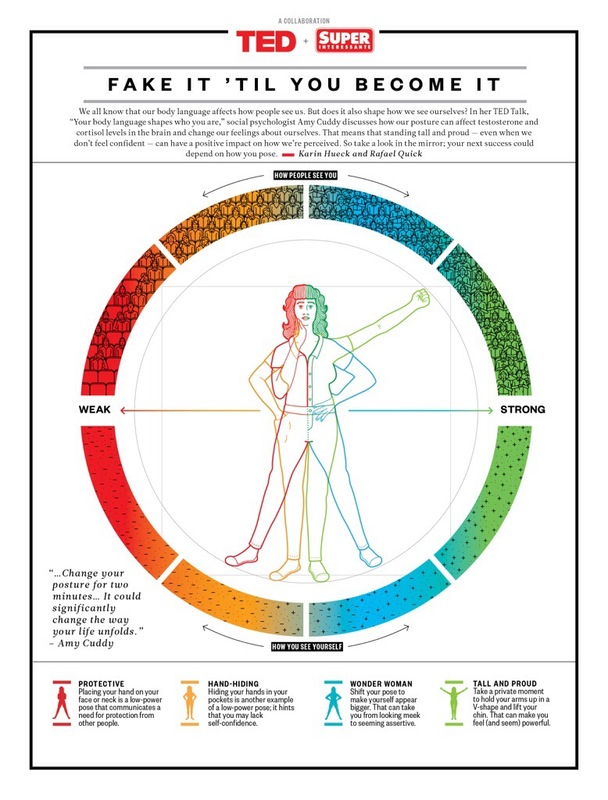 Some extra interviews with Amy Cuddy are worth checking out. The take-away here is to check if you are shrinking or expanding. If we can expand your body-language, we can expand out confidence, and others’ perception of us.